What is Stollen (also called Dresden Stollen, Weihnachtsstollen, Christstollen or Butterstollen)? I sometimes hear Christmas Stollen bread described as German fruitcake. But it’s not fruitcake! I’ve also heard people ask for the recipe for Stollen cake, but it’s more of a bread than a cake. Stollen does have fruit (raisins) in it but it doesn’t taste anything like fruitcake. It’s a dense but light, buttery, slightly sweet yeast bread with powdered sugar on top. 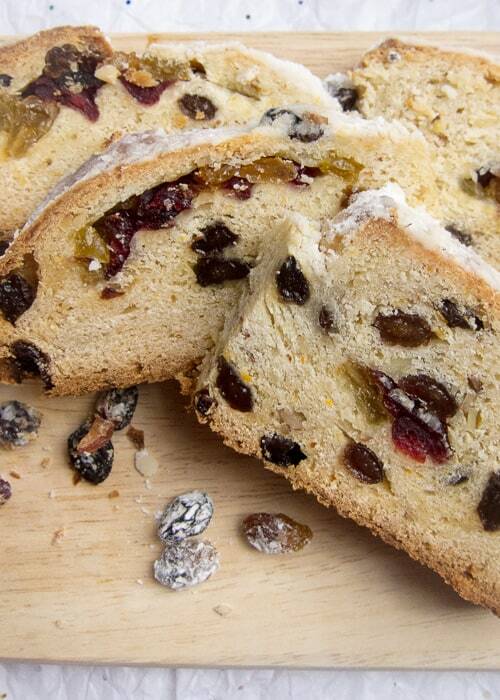 What’s the correct Stollen pronunciation? In German it’s pronounced shto-lun. Watch the video below to hear how it’s pronounced. Does Dresden Stollen have to be made in Dresden? 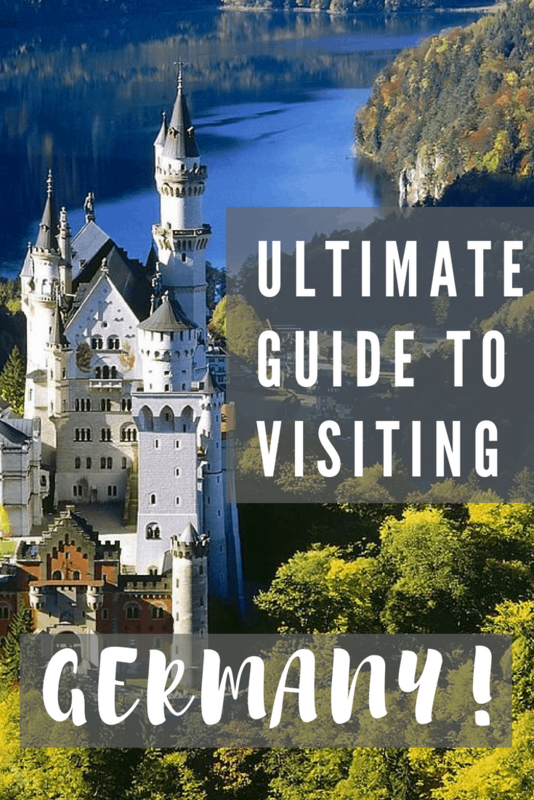 Yes, in or around Dresden. 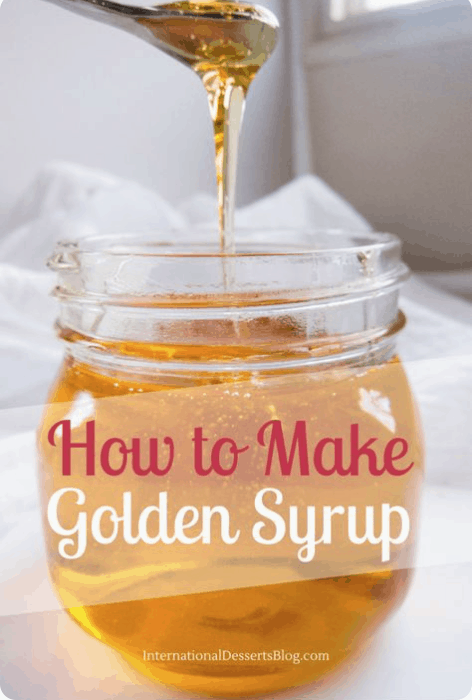 There are also guidelines regarding the ingredients, minimum amounts of butter and raisins, and shape that bakers must follow in order to receive the official Dresden gold seal. 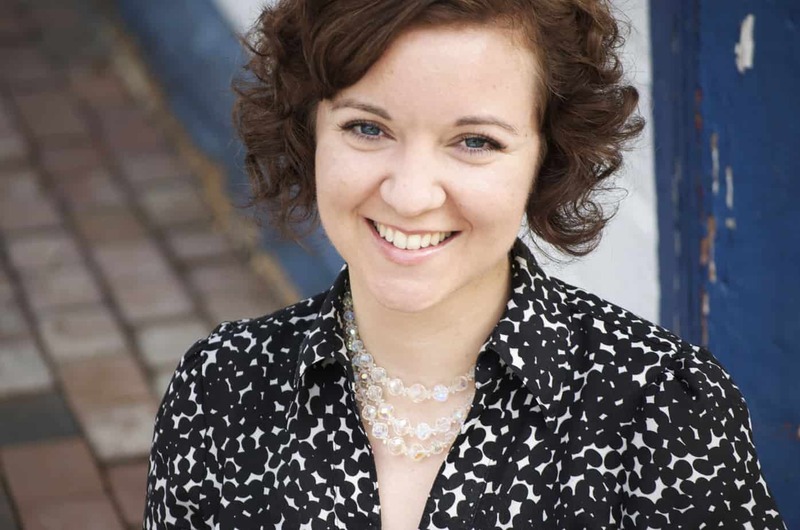 Watch the video below to learn more about Dresden Stollen! 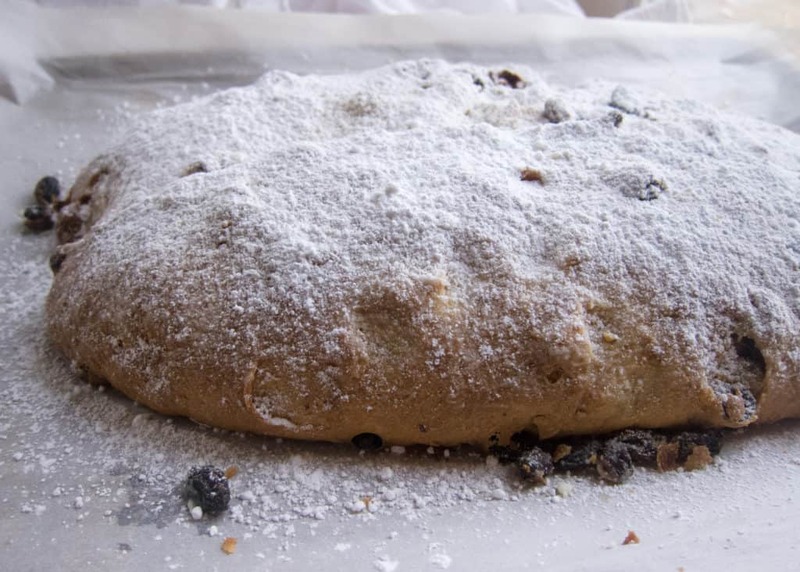 What’s the history of Stollen? Great question! To learn about the history of Stollen, with this short video. You’ll also find out why green tomatoes were once used in Stollen (but aren’t allowed anymore in Dresden Stollen)! Is this a Stollen recipe with marzipan? 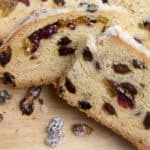 In Germany you can buy Stollen with or without marzipan, and this recipe gives you the same option. I don’t like marzipan so I leave it out. But it’s easy to add it to your Stollen if you like it. 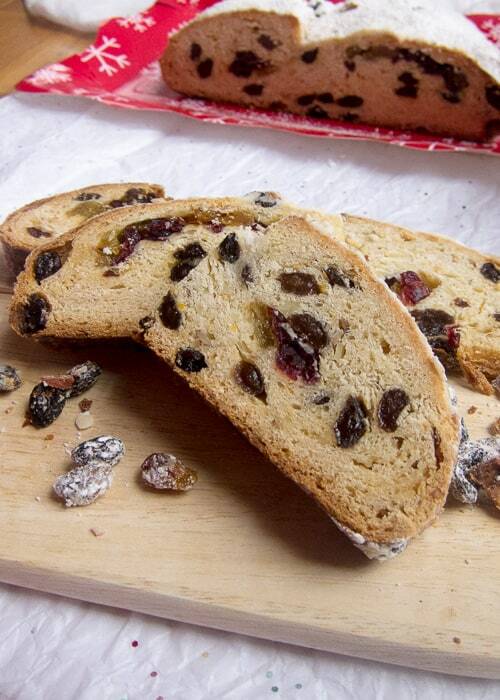 Does Stollen have candied fruit in it? 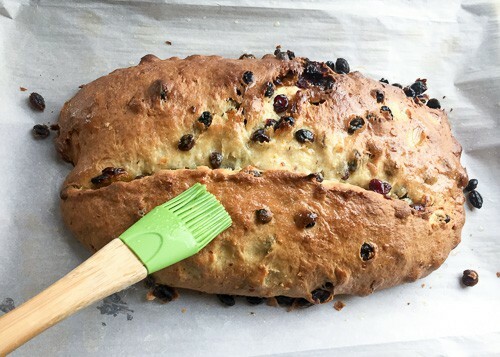 I’ve seen pictures online of Stollen with that bright red and green candied fruit in it but I’ve never seen it in Germany (doesn’t mean it doesn’t exist, I’ve just never seen it). 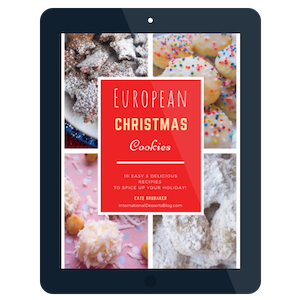 I make mine with dried fruit – raisins and sometimes dried black currants or cranberries – and fresh candied lemon and orange zest. Does Stollen have nuts in it? Typically, yes. 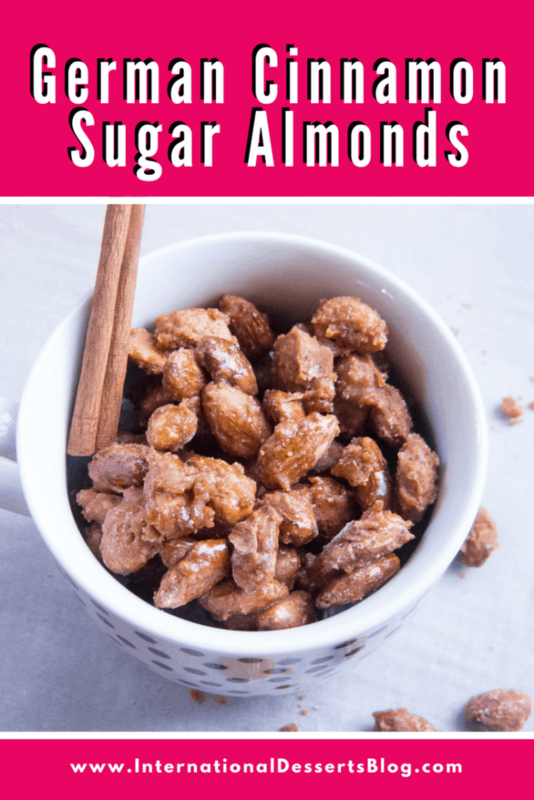 I add almonds to mine but you can leave them out if you prefer. 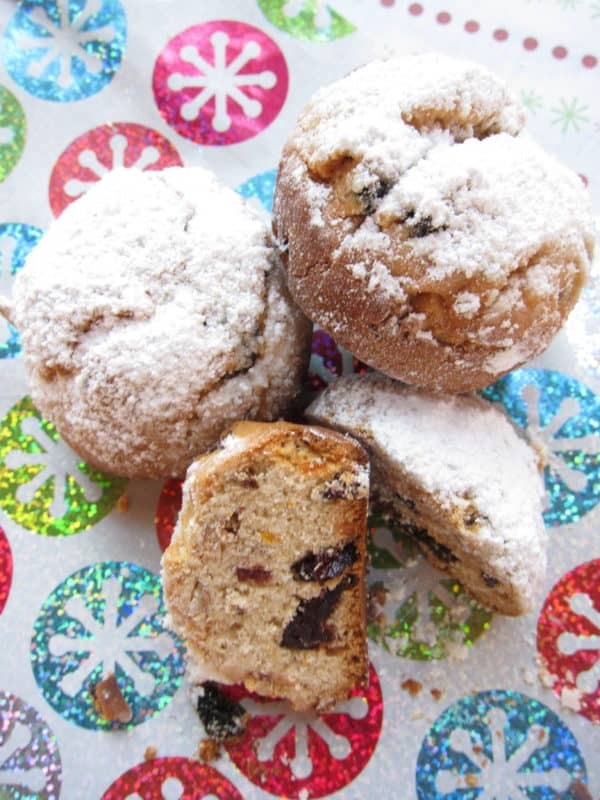 Do you have a recipe for mini Stollen or Stollen bites? Yes, this one! 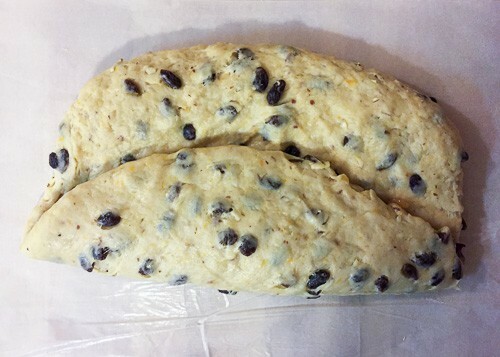 For mini stollen, simply divide the dough to make smaller loaves. For Stollen bites, roll dough into golf ball size balls, bake until golden brown, and then roll the entire bite in butter and then powdered sugar. So good! Where can I buy Stollen? If you run out of time to make it or want to try a loaf before baking one yourself, you can easily buy some. If you have access to a German bakery, I’d buy a loaf there because it will be the freshest. 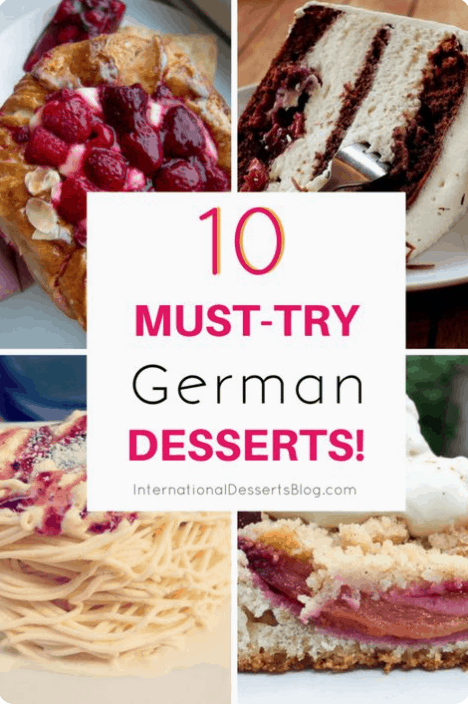 If you don’t have a German bakery nearby, try World Market, Whole Foods, Wegmanns, Aldi, Trader Joe’s or specialty food store. I’ve had store bought Stollen and it was mostly fine…not like homemade but pretty good. If you’d prefer to order a loaf, you can get an original Dresden Stollen here (in a box or gift tin). German Stollen Bread is very easy to make. Soak the raisins, chop the almonds, mix the dough, let it rise, knead in the zest, almonds and raisins, let it rise again, shape, bake, slather on melted butter and powdered sugar (twice). Done! It may seem like a lot of steps but it comes together quickly and easily. Note – since you need to soak the rasins and make the candied zest, I recommend preparing these two things a day or two before you make and bake the dough. 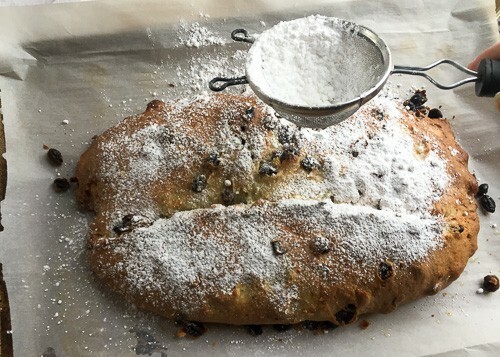 If you’re nervous about getting the proper Stollen shape, make Stollen bites instead (see instructions in the recipe notes below)! 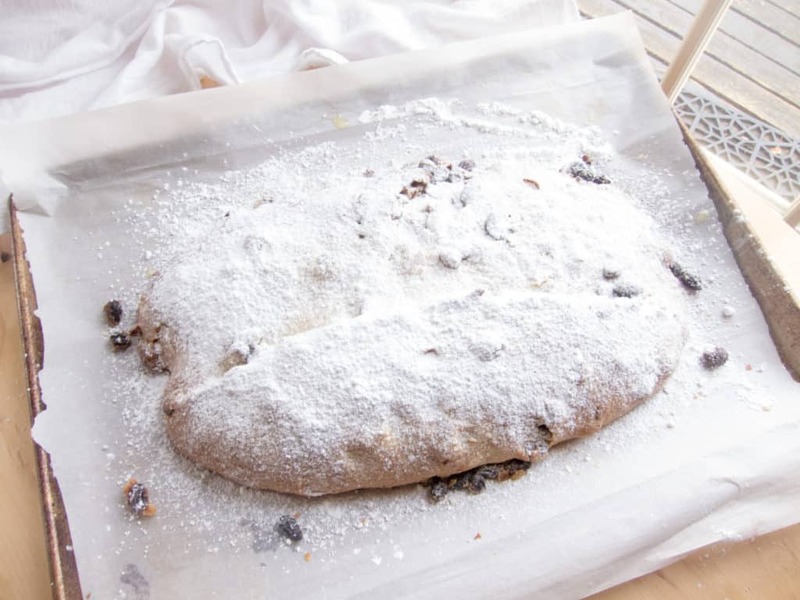 Just like the mini mince pies, this recipe for Stollen calls for mixed candied peel. 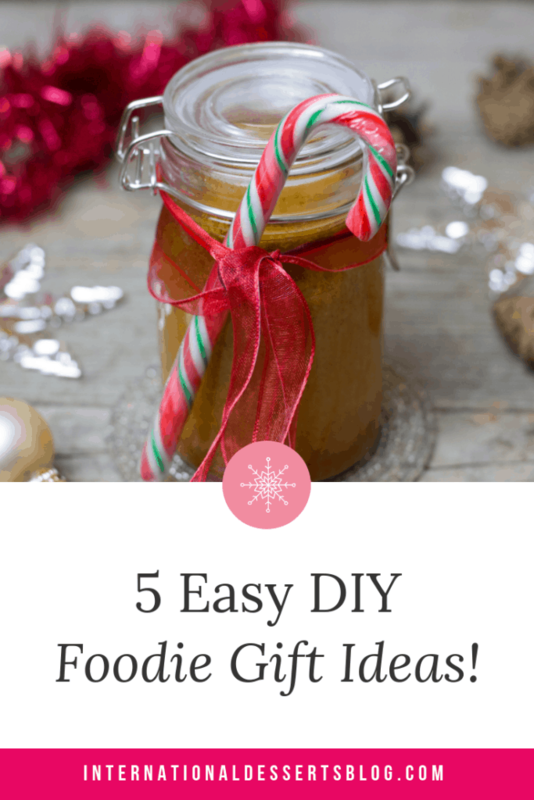 Once I figured out that I could make my own, I decided to go that route, instead of ordering some online (all I found at the grocery store was candied fruit for fruitcake). The mixed peel recipes I found suggested washing oranges and lemons, then slicing off the peel, scraping off the pith, and then cutting the rind into slices. I didn’t have the time or patience for that, so I just zested several oranges and lemons and made mixed candied zest. It worked great! As I mentioned earlier, I don’t like marzipan, so I don’t add it to my Stollen, and it’s not in the official recipe. If you want it in yours, see my notes in the tutorial for when and how to add it. Wash 5-7 oranges and lemons (use organic if you can). Then zest the citrus using a microplane. Heat 3/4 cup water and 1 cup sugar in a small saucepan over medium high heat. Add zest and stir. Bring to a low boil and simmer for 10 minutes. Then, strain out the liquid and let the candied zest cool in a small bowl. Cover with plastic wrap and store in the fridge. Sidenote…What to do with the zest-less lemons and oranges? 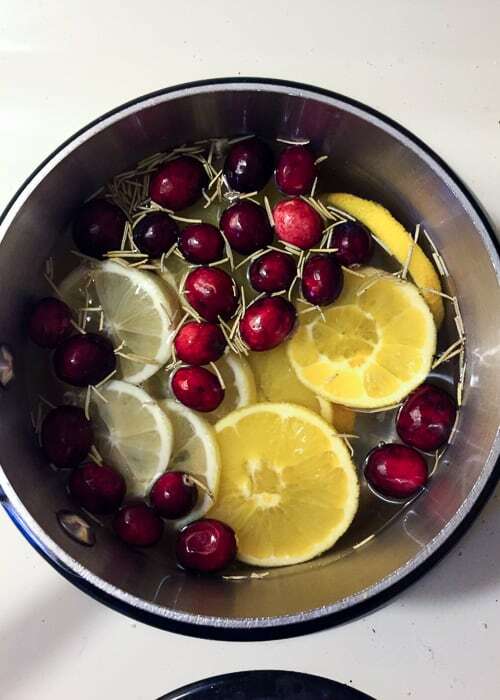 Slice them up, put them in a pot of water, add cloves, a cinnamon stick, a few cranberries, and some rosemary, and then simmer it on the stove. Your house will smell wonderful! Place 2 1/2 cups of raisins in a small bowl and add 1/4 cup rum. (I didn’t have any rum and didn’t want to run to the store, so I used 1/4 cup orange juice instead.) 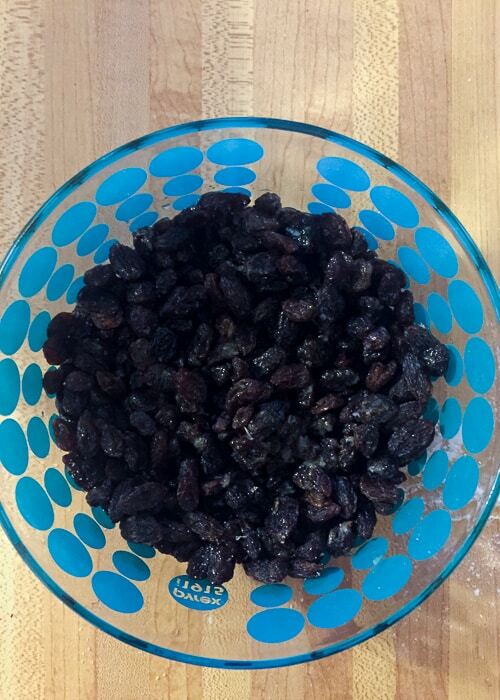 Soak raisins for at least a couple hours; overnight is ideal. Mix 4 1/3 cups flour, 3/4 cup sugar, 1 tsp salt, and 1 packet of yeast in a large mixing bowl. Then heat 1 cup + 2 Tbsp butter and 1 cup milk in a small saucepan over medium heat. 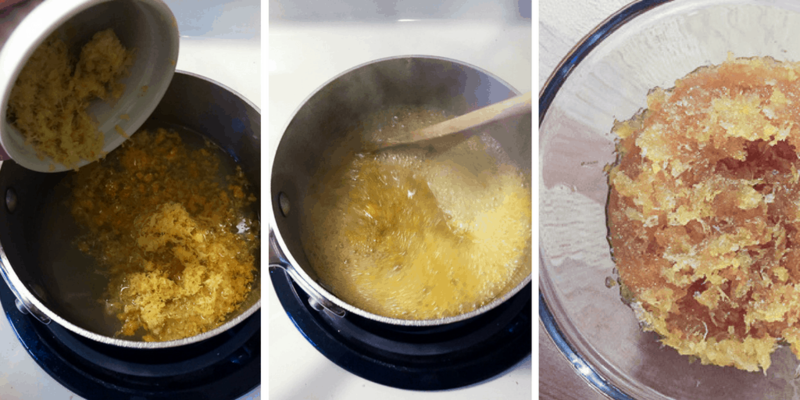 Once the butter has melted, take the pan off the heat and let cool 5 minutes. Add to the dry ingredients. Then add an egg and stir to form a dough. Some recipes I looked at recommended adding the rest of the ingredients right away, others suggested letting the dough first stand for 10 minutes, and still others called for letting the dough rise for an hour. Some recommended kneading the dough, while others didn’t. Here’s what I found worked the best. 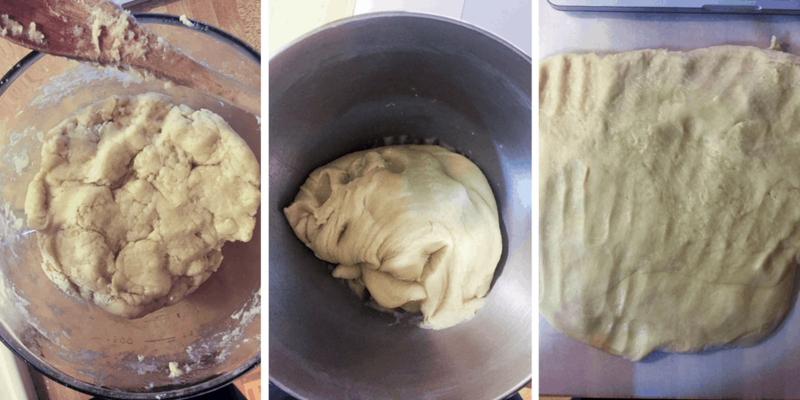 Place the dough in the bowl of a stand mixer. Using the bread hook attachment, knead the dough on low speed for 10 minutes. Then, let the dough rise for at least 10 minutes (the dough won’t increase in size). Then place the dough on a floured surface and press it out flat. Spread 4 Tbsp of the candied zest and 1/4 cup chopped almonds over the dough. Fold dough in half, then in half again the other way. Knead dough 2 or 3 times. Press dough out again and repeat the process with the rest of the zest and chopped almonds. Press out the dough a third time and add 3/4 cup of raisins. Fold and knead the dough, then press it out again. 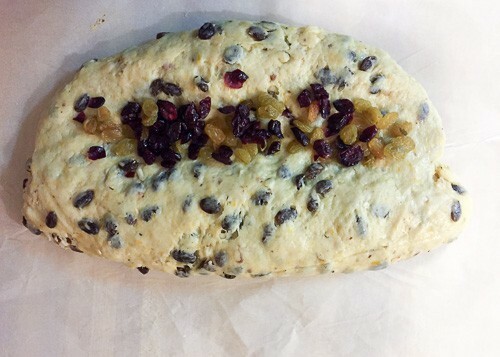 Add another 3/4 cup of raisins, fold, and knead until everything is well incorporated into the dough. Press dough out a 5th time, but this time press down the center more than the sides. You want a narrow “trough” in the middle of the dough. 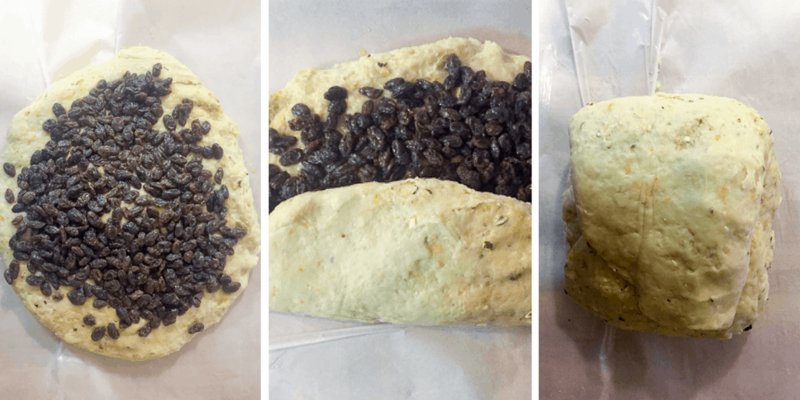 This is how you get the unique Stollen shape. 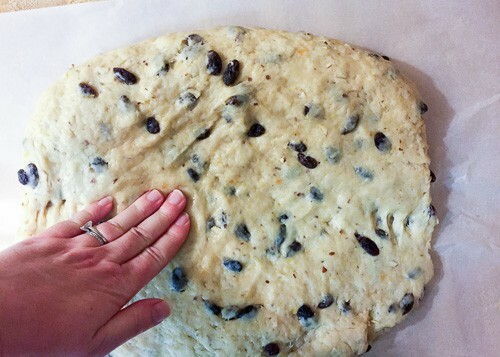 Add 1/2 cup raisins to the center of the dough (the area you pressed down). I switched out some regular raisins for golden raisins and a few dried cranberries at this stage, but you can stick with regular raisins if you prefer. Fold the bottom third of the dough so it covers the raisins you just added. The flip the dough over. Then fold the top 1/3 of the dough over the raisins you just added. Transfer to a lined baking sheet. Bake for about an hour in a 350 F oven. Enjoy how delicious your house smells while this bread is baking! 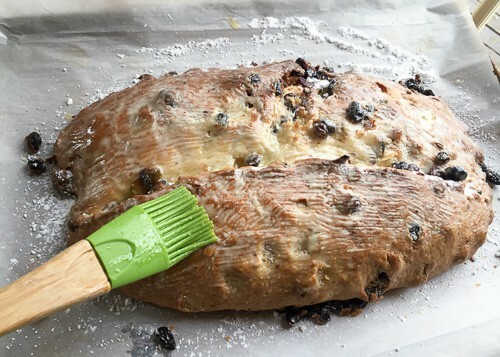 Here’s a video showing how a chef uses a rolling pin to shape a Stollen loaf. He also shows when and how to add a marzipan rope. When the Stollen is finished baking, melt 1/4 cup butter and brush half of it over the top of the bread. Sift 1/4 cup powdered sugar over the top. Then brush the rest of the melted butter over the top (yep, over the first layer of butter and sugar). Sift another 1/4 cup of powdered sugar over the top. Let the Stollen cool. See that cute little Stollen to the left? It’s a glass German Christmas Stollen Christmas ornament for your Christmas tree (should you celebrate Christmas and have a tree, that is). It comes in a nice gift box so it would make a great gift, too. Click here to check out this German Stollen bread Christmas ornament! 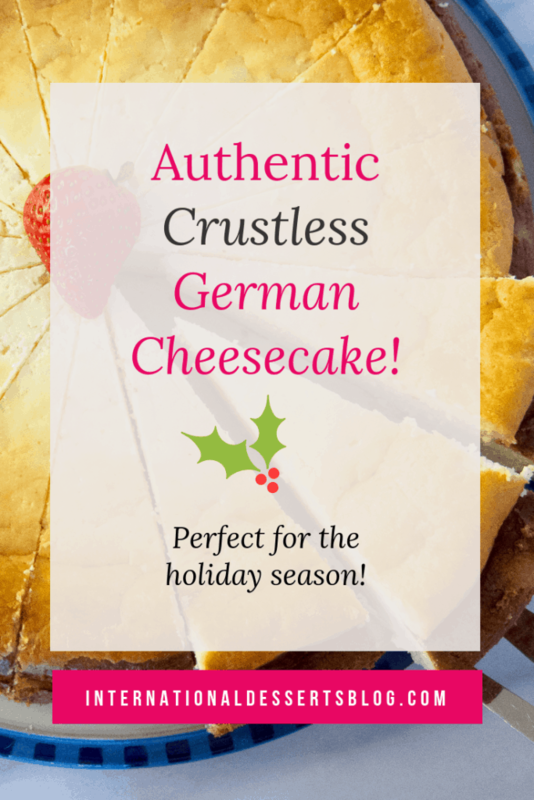 This fruity, buttery bread is a delicious German Christmas tradition! You can make this with or without marzipan. Wash oranges and lemons (use organic if you can). 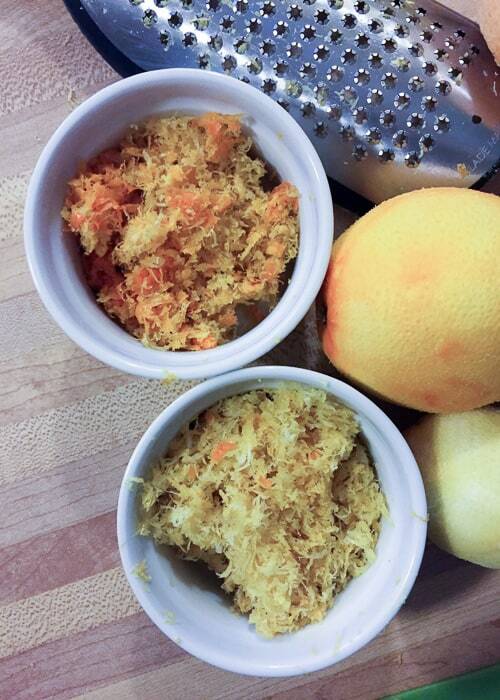 Use a microplane to zest lemons and oranges. Mix sugar and water and bring to low boil over medium high heat. Add zest and simmer for 10 minutes. Take off heat and let cool. Strain liquid and let candied zest cool in a small bowl. Soak raisins in rum (or orange juice if you prefer a non-alcoholic version) for at least a couple hours (overnight is ideal). Mix flour, yeast, sugar, and salt in a large mixing bowl. Heat butter and milk in a small pan over medium heat. When butter is melted, take off heat and let cool 5 minutes. Pour milk and butter mixture into dry ingredients and stir into a dough. 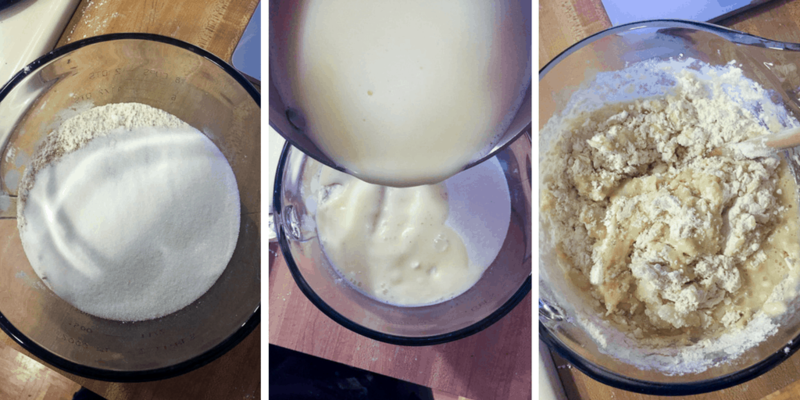 Transfer dough to a stand mixer. Using the hook attachment, knead the dough on low speed for 10 minutes. Then let the dough rise for at least 10 minutes (dough won't increase in size). Transfer dough to a floured surface. Press it out into an oval. Spread 1/2 of the candied zest and chopped almonds over the dough. Fold dough in half, then in half again the other way. Knead dough 2 or 3 times. Press dough out again and repeat the process with the rest of the zest and chopped almonds. Press out the dough a 3rd time and add 3/4 cup raisins. Fold and then knead the dough as described above. Press it out a 4th time and add another 3/4 cup raisins. 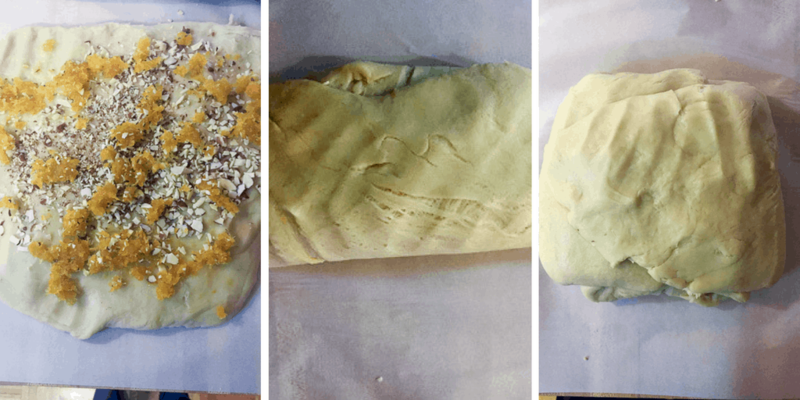 Fold and knead again until everything is well incorporated into the dough. Press dough out a 5th time, but this time press the center down more than the sides to form a narrow trough in the middle of the dough. This is how you get the unique Stollen shape. Add 1/2 cup raisins to the trough (the area in the middle that you pressed down). Note: I switched out some regular raisins for golden raisins and a few dried cranberries at this stage, but you can stick with regular raisins if you prefer. 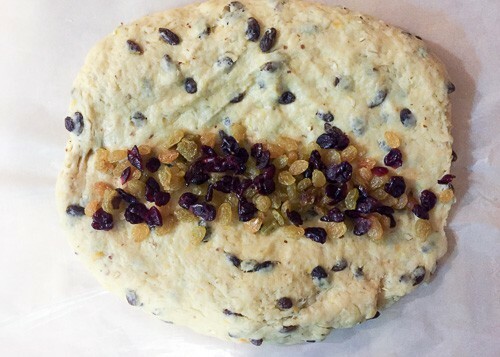 Fold the bottom third of the dough so it covers the raisins you just added. Then flip the dough over (see photos above). Add the rest of the raisins to the trough part of the dough (see photo above). Fold the top part of the dough over the raisins. If this seems confusing, be sure to look at the photo tutorial above! 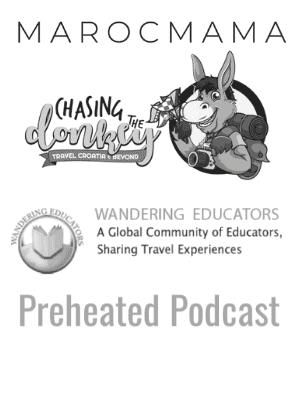 Preheat oven to 350 F. Transfer to lined baking sheet. Bake for 1-1/2 hours or until top is golden brown. Brush melted butter over the top of the Stollen. Sift half of the powdered sugar over the top. Then brush the rest of the melted butter over the top (over the first layer of butter and sugar). Sift another 1/4 cup of powdered sugar over the top. Let the Stollen cool before serving. 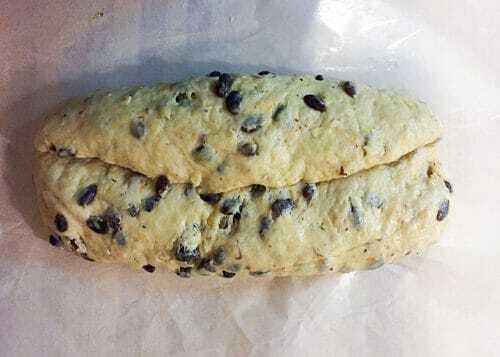 For Stollen bites -- roll golf ball sized chunks of dough (don't over handle the dough) and bake on a baking sheet for about 25-30 minutes or until golden brown. Once out of the oven, let cool to the touch. Dip each Stollen bite in butter then toss in powdered sugar. Let Stollen bites cool until set on a baking sheet. Store in an airtight container. Egg or no egg? 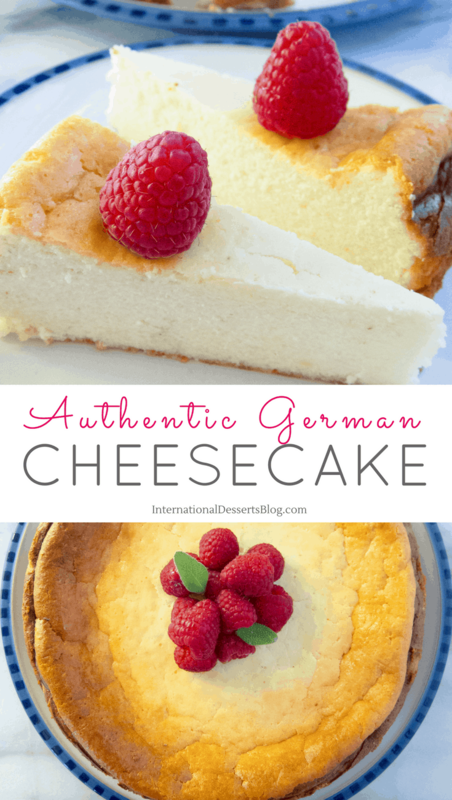 The traditional German recipes I've always used haven't included an egg in their ingredients. I've made it both with and without an egg, and it's turned out great both ways. I've added an egg to this recipe because I think it makes it a bit more "fool proof" and a bit lighter. most stollen recipes call for eggs. is there a reason there are not eggs in your recipe?